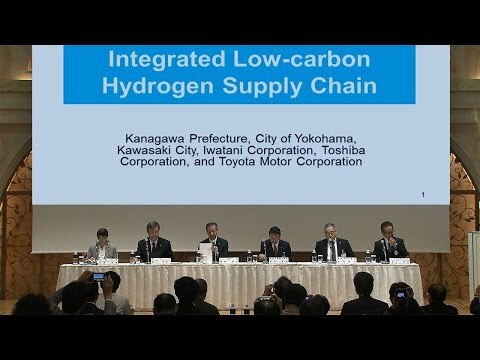 A Japanese partnership, consisting of the Kanagawa Prefectural Government, the municipal governments of the cities of Yokohama and Kawasaki, and three private sector companies, today announced the forthcoming start of a project to implement and evaluate an end-to-end low-carbon hydrogen supply chain which will use hydrogen produced from renewable energy to power forklifts. Announced last September, the project will be carried out at facilities along Tokyo Bay in Yokohama and Kawasaki, with support from Japan's Ministry of the Environment. This low-carbon hydrogen supply chain is expected to reduce CO2 emissions by at least 80 percent compared with a supply chain using forklifts powered by gasoline or grid electricity. The project's aim is to establish a hydrogen supply chain, investigate costs, and estimate potential CO2 reductions that can be achieved with a full-fledged supply chain in the future. Hydrogen will be produced using renewable energy generated at Hama Wing to operate a water electrolysis system. The management system will enable flexible, CO2-free, hydrogen production that accounts for temporary discrepancies between power output and hydrogen demand. Sufficient hydrogen to power fuel cells for two days will be stored onsite. Electricity will also be stored in an environmentally-friendly storage battery system that re-uses batteries from hybrid vehicle batteries, thus ensuring a stable hydrogen supply even when Hama Wing is not operational. The hydrogen will be compressed for use in forklifts, and delivered in hydrogen fueling trucks (the first of their kind to be used in Japan). The consumption of hydrogen by the forklifts will be constantly monitored, so as to ensure optimal transportation and supply to meet user needs. Japan's first fuel cell powered forklifts, which Toyota introduced in February 2016, emit zero CO2 during operation. The demonstration project will provide data for assessing future courses of action required to reduce hydrogen costs, including the establishment of a mass production process, and the steps needed to implement deregulation. It will also contribute to discussions on developing a model for promoting the adoption of hydrogen through technological innovation, and the development of full-fledged supply chains, based on projections of needs in 2030. The project will focus on reducing CO2 emissions, with current estimates suggesting that the establishment of this low-carbon supply chain will reduce emissions by at least 80 percent (compared with a supply-chain using forklifts powered by gasoline or grid electricity). The project will also promote the investigation of methods to further reduce CO2 emissions. Following a preparatory period, trial operations of the project are scheduled to begin in this autumn, with the introduction of a single forklift at two facilities, and the initiation of the hydrogen delivery system using hydrogen refueling trucks. Full-scale operations will start in FY2017, when a total of 12 forklifts will be deployed―three each at four facilities. During this time, the entire system will start operating―including production, storage, compression, delivery and use of hydrogen.